Paradise Lodge and Bungalows are Located in Canada’s Banff National Park in the heart of the Canadian Rockies just 1 km from world-famous Lake Louise. 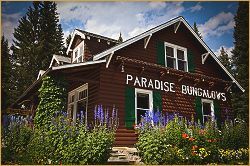 Paradise Lodge and Bungalows allows each guest to fully enjoy a true mountain experience. Our guests visit from around the world to relax and surround themselves in our spectacular scenery. Beautiful Lake Louise, Alberta just steps from Paradise Lodge. Originally named after a segment of hiking trails called Paradise Valley and Paradise Creek, easily accessible for the hiker’s pleasure. Red Cooper, original founder, hiked these trails many times and proclaimed “Never have my eyes experienced such a magnificent sight as the mountains and area surrounding Paradise Valley”. Two types of accommodations are offered at Paradise Lodge, one being individual cabins which have been fully modernized and feature private access and parking. Built in the1930’s, the cabins have amazed guests with their charm and cleanliness and were recognized as an important cultural and heritage resource in the recently completed Lake Louise Community Plan. The cabins have been fully modernized with the redecoration respecting the heritage and rustic theme. The second type of accommodation is provided by way of two separate building housing lodge suites. The lodge suites feature one and two bedroom units with and without kitchens. In the suites, care has been taken to preserve the rustic theme without sacrificing modern-day amenities. Owned and operated by the Pedersen family for the past 50 years, the Pedersens take extreme pride in Paradise Lodge. Consequently, extremely high standards of quality and excellence have been maintained. 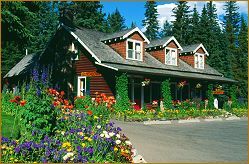 Paradise Lodge is well known for its flower gardens and groundskeeping and is an 21 time recipient of the Alberta Housekeeping Award.